Four County Import Service Specializes in Factory Recommended Service Utilizing Genuine Factory Parts. Recently had a great experience with Four County Auto Imports for brake repair and alignments for my Honda and my daughter's Chevrolet. Quick and affordable. Will definitely return! Four County has been serving my family's vehicles for many years, and continues to provide excellent service and fair prices. Thanks Four County for honoring the warranty on the parts installed in my Hyundai repairs. No questions asked. Friendly repairs. Thanks for helping me on a cold rainy morning! You guys are my knights in shining armor! Jeff, I just wanted to thank you for all that you have done for me and my car. Thanks for being so patient with me. I will definitely recommend you to others. Sincerely, A happy customer for many years to come! Four County Auto Service is conveniently located in Mt. Airy, MD not far from Damascus. We are called Four County Auto Service for a reason! We offer auto repairs to customers in Frederick, Carroll, Howard & Montgomery County Maryland. With over 50 years’ experience, we providing quality preventive auto maintenance and auto repair services on all makes and models of vehicles. Our ASE & factory trained technicians are fully committed to the satisfaction of each and every customer. At Four County Auto Service, we stand behind our reputation for reliable, trusted auto repairs at fair prices. Four County Auto Imports, you’ll find ASE & Factory Trained auto repair professionals experienced in all makes and models of vehicles, friendly service, reliable diagnostic services, and affordable auto repair prices conveniently located in Mt. Airy, MD. We offer a shuttle service (limited area), towing, and a warranty on parts and labor for your convenience. Four County Auto Imports, conveniently located near Damascus, MD, has over 50 years’ experience providing quality preventive maintenance and service on all makes and models of vehicles. We specialize in factory recommended service utilizing genuine factory parts. Our ASE certified mechanics in our Mt. Airy auto repair facility can handle any repair job and are experienced in preventative maintenance on all makes and models of vehicles. Being without Air Conditioning in your vehicle during Maryland summers is less than comfortable, to say the least. Bring your vehicle into Four County Import Service for quick and affordable auto AC repair near Damascus MD. We offer auto AC repair to customers in Frederick, Carroll, Howard & Montgomery County Maryland. The condition of your car or truck’s brakes, is one of the most important safety concerns in your vehicle. Four County Import Service Specializes in brake repair in Mt. Airy MD. We offer brake repair to customers in Frederick, Carroll, Howard & Montgomery County Maryland. The steering and suspension system on your vehicle is responsible for maintaining good driving performance and comfortable riding conditions. If your car or truck is in need of suspension system repair or maintenance, the experts at Four County Auto Imports in Mt. Airy, MD are here to help. Four County’s technicians are experienced in all aspects of electrical repairs for all types of vehicles. Maintaining and repairing your vehicles engine, should only be left to professionals like the skilled mechanics at Four County Auto Imports. 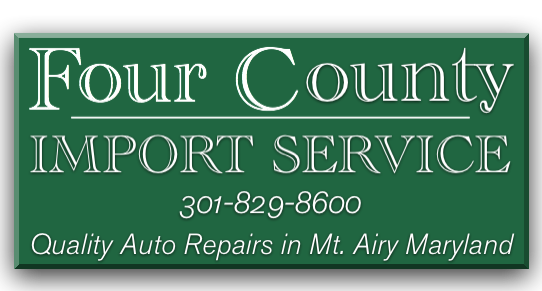 If you need your engine repaired, replaced or rebuilt near Damascus, MD, bring your vehicle to Four County Import Service. We offer engine repairs to customers in Frederick, Carroll, Howard & Montgomery County Maryland. Whether you are in need of an emissions related repair or any other type of exhaust systems maintenance or repair, you can rely on the technicians at Four County Auto Imports to get the job done right the first time. We offer exhaust and muffler repair and replacement services to customers in Frederick, Carroll, Howard & Montgomery County Maryland. Four County Auto Imports is your source for oil and lube service on all makes and models of cars and trucks. Regular oil changes are one of the most important parts of maintaining your vehicle to ensure its optimal condition. We offer lube / oil change services to customers in Frederick, Carroll, Howard & Montgomery County Maryland. Experts agree that used cars must be inspected before the final negotiation for purchase. Before you buy a new car or truck, bring your vehicle into Four County Auto Imports for a pre-purchase inspection to ensure your purchase is a good one. Avoiding a timing belt replacement can result in complete engine failure. Four County Auto Imports provides timing belt maintenance and repairs in our Mt. Airy auto repair shop that help avoid more costly and serious repairs. We offer timing belt and drive belt repair to customers in Frederick, Carroll, Howard & Montgomery County Maryland. Factory Scheduled transmission maintenance can help prevent transmission problems, and avoid costly repairs. Four County Auto Imports, in Mt. Airy, MD, offers preventative transmission maintenance and transmission repairs for all makes and models of vehicles. We offer transmission repair to customers in Frederick, Carroll, Howard & Montgomery County Maryland.